Citrix announced its acquisition of Sanbolic at its partner conference last week, giving it a hyper-converged solution to compete with VMware’s VSAN. But reading between the lines, the acquisition, along with VSAN, further validates that the SAN is dead for End User Computing (EUC). Citrix and VMware, of course, dominate the EUC market. Both organizations have been partnering with Nutanix for some time. They are enthusiastic about the ability of hyper-converged infrastructure to dramatically accelerate VDI by slashing the cost, complexity, risk and performance inconsistency of a virtual desktop deployment. With the advantages of hyper-converged infrastructure, 2015 may well finally be the year of VDI. 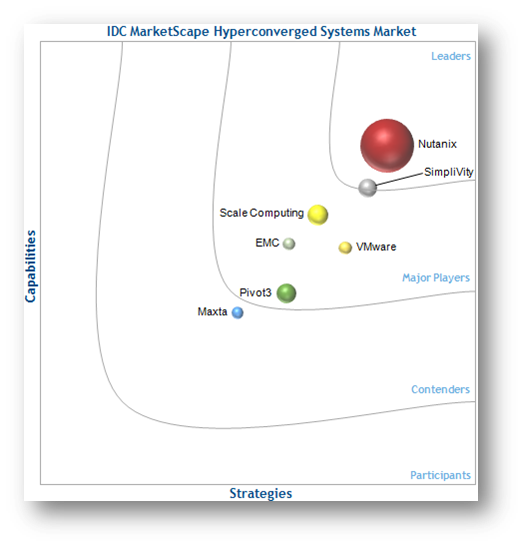 A first-ever market share report for hyperconverged solutions from IDC ranks the contenders as of August 2014 based on execution, strategy, and market share. The size of a vendor’s bubble reflects that vendor’s market share. Nutanix is firmly in the leader position with 52% of the entire market. IDC’s next report will presumably include Citrix along with other datacenter incumbents and yet more start-ups. What about Sanbolic vs. Nutanix? Sanbolic Technology Still Needs to be Improved and Integrated. Sanbolic is a 14 year old company with approximately 30 employees. Sanbolic has been partnering with Citrix since at least 2010. The Nutanix and Citrix relationship is much more recent, but is rapidly building great traction including the only hyper-converged CVS (Citrix Validated Solution). Nutanix already enables the software-defined simplicity, elegance and automation that Citrix CEO, Mark Templeton, spoke about in his keynote. VSAN Parallel. A similar situation has been taking place with VMware VSAN. Even though Nutanix competes with VMware in the hyper-converged space, we still have a strong partnership – particularly with VMware EUC. This bodes well for continued momentum with Citrix. Citrix-Specific Innovation. Nutanix continues to innovate to add further value to Citrix customers. At Summit, we formally announced the Nutanix Plugin for Citrix XenDesktop. This patented capability enables the desktop folks to handle the infrastructure tasks. The Plugin for XenDesktop provides full SLA management direct from the XenDesktop Studio Console. No one else does this. Beyond the contenders featured in the IDC hyper-converged report, five of the seven leading datacenter hardware manufacturers now all have launched or announced hyper-converged solutions (not even including EVO:Rail solutions): Dell, HP, EMC, Cisco and NetApp. This is expected. Nutanix is not going to turn the $73B server & storage market on its head without lots of competition. As the competition starts to mature and improve, the onus will be on Nutanix to continue innovating and raising the bar in areas such as performance, simplicity and scalability as well as in capabilities such as hybrid cloud enablement and management. This is the only way we will maintain our leadership position. I believe Nutanix is up to the challenge.